I had this huge long explanation for why I did this but my cats decided to turn off my computer. I'm not writing it again so instead. Here's a quicky version of it. I am a huge BCB and a huge Homestuck fan so I decided to parody the two. These are the god tiers of each character if they ever played sBURB. This has caused me to remember why I abhore doing group pictures. I couldn't even add a background to this cause it was killing my hands just to finish a flat coloring. But I did finish. If anyone has read Homestuck good for you and I highly advise hanging on through the first act because it gets a lot better. also eridan is a prince.. just.. no..
wow this i really great. you choose some interesting god tires for em all. i think you got mosta there aspects pretty good. i really like palous and carters. make sense for em. daisys i real good too. Oh wow this is incredible!! I mean the names are all moon speak to me but wowwwwwww this is awesome!!! Sam - lol yeah but dirk is also a prince and he has kamina glasses and Paulo is kamina cat. besides the literal translation of prince of time is 'destroyer of time'. So I think it fits paulo pretty well. E2s4 - oh thank you! I was careful to make sure none of their godtiers were the same as any canon homestuck characters. DLancer - say what now? :? You didn't say what God Tier Sandy is!! It looks like something of void, though. Care to enlighten me? Oh you're right! I did forget her. Sandy is the seer of void. She is a literal void of information but can see the others through her connection with mike. It made sense for her. I just hope you didn't make Mike the Thief because he "hurr durr stole Lucy's heart and broke it hes so meeeeen" 'cause that would ruin this otherwise pretty awesome picture. It makes sense for him to be the "of Heart" though I'm not sure why he'd be the Thief. I'd expect him to be the Page, to be honest. Yaschiri - Why thank you! I spent a LOT of time (like two whole days of my spring break) I killed my wrist on this. And I can understand. It was very hard to get into, the whole first act is like this right of passage that you have to overcome in order to deserve the rest. It doe's pick up and it is worth the read if you don't mind length. Sushi - I am NOT currently fond of Mike in the least but no. That was not the main reason that I made him the Thief of Heart. The two thieves that have been introduced so far are classifiable as "mean" if you don't recognize and character development but the Vriska the Thief of Light is in fact my favorite character. So I didn't make him the Thief because I disliked him. In fact, the thieves seem to be the most responsible characters when it comes to the movement of plot flow, and Mike does just that in BCB. Another reason was, in a way, what you initially thought. I've noticed that throughout the plot line of BCB, Mike has a charisma that draws people, more specifically of the female variety, towards him. You can see that in his middle school fangirl and the undeniable attraction that three main characters have towards him. Thieves are an active class, meaning they steal their element to benefit themselves. Vriska stole Light, better interpreted as Luck, and used it to diminish the luck of her opponents. But when luck was eliminated from the equation she suffered greatly. Trust me. Every character has been fully thought and reasoned through. But I'm glad you thought about it. I like being able to explain my choices. Like I said I had a HUGE list of who was what and detailed explanations as to why but my comp was turned off and I died inside. So I decided to explain when people ask me instead. ... Damn, this is perfect. This is beatiful... so beautiful. My favorite webcomics have been mixed. Hah. Mike's a Thief of Heart. 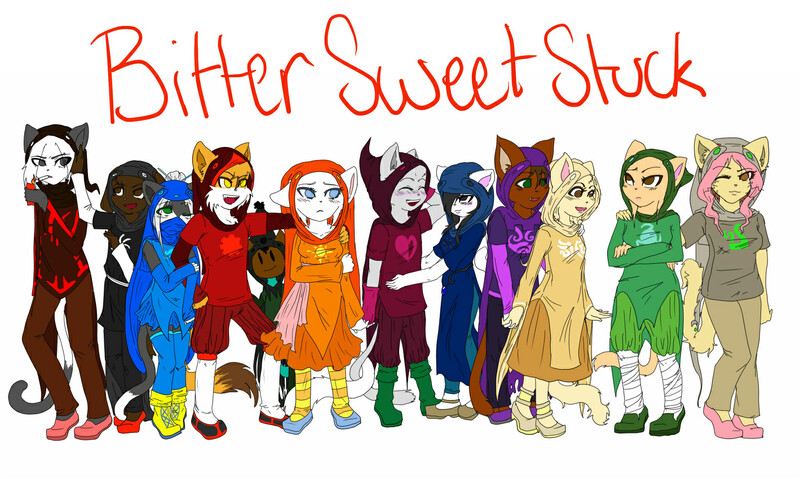 I love this art and how it perfectly fits into both BCB and Homestuck! This is amazing! I LOOOOOOVE Homestuck! You get all the hearts <3<3<3 All of them. And I see what you did there Karkat. daisy- as a sylph its her job to provide her fellow players with her aspect; in this case hope. her job and powers would be to bring hope to everyone and keep their spirits up, much like she does in the comics, despite her drama & angst, she'll usually put on a good face for the others. mike- theives take, they will take other's aspects and use it for themselves. wow this basically describes mike when hes in full blown jerk mode. his powers come from other people's emotions and love itself. Oh wow! This looks really good. I love how you took time to make sure the godtiers fit with each character--whereas most people take some random aspect then put a title that they think 'fits' to it. If you could explain to me though, why is Jasmine a Rogue, Carter a Bard, and (especially this one) David a Page of Space? I'd love to explain this! It's been a while so these may not be entirely accurate to the way I felt about it at the time, but I'll try my best! Alright. Let's start with Carter as he's the easiest to explain. Carter has scared the **** out of me from the get go, he always seemed like a wildcard even if he wasn't counted amongst the main cast. Like other bards he displays an intense obsession towards a particular character and has shown to be more than willing to do what it takes to get what he wants. The Doom aspect was more for the fact that he's scary as ****. Jasmine is a rogue, partially because of the playful aspects she displays that have been so far the norm of the rogues. The phrase associated with the rogue, like it's active counterpart the thief is "I steal..." While thieves steal for the benefit of themselves, Jasmine would steal her element for the benefit of others. When Paulo was caught in his web of womanizing it was Jasmine who gave him a chance to catch his breath and settle down for a while. Dave is a hero of Space because of the close ties needed between the hero of time and the hero of Space. He is a page because of the hitherto pages dedication to their friends but the pages often make mistakes and screw things up for other people. They are often to absorbed in their own feelings to be considerate of others but are VERY obsessed with the way they are viewed by their friends. Often going to great lengths and physical pains to live up to the expectations others have in them. Dave is the only member of the main group who is a dog, and displays a large amount of the loyalty that is associated with his kin, but he's never afraid to joke around or tease others. Why is Daisy the Sylph of Hope? Theraiser2000 - Thank you!!! I'm really happy you think so! I didn't take any god tier personality tests for the characters, honestly. I feel like I've got a fairly good grasp of the titles and elements though so I spent a LOT of time matching them to their roles. When I say a lot I mean A LOT. I put a lot of emphasis as well onto the relationships and the influences they would have on each other. Teruko - I placed Daisy in that role for a lot of reasons. One being that the hope players often struggle with insecurities and troubles within their relationships with others. Daisy had a long history of struggling with her own self acceptance and with the acceptance she wanted from others. As a Slyph of Hope, the passive counterpart to the Seer and with the role of bringing understanding of her element to others, she would have to inspire and help give the others hope even in the most hopeless of situations. From what I've seen of her interactions with Abbey, ESPECIALLY during his struggles with his past, this role is PERFECT for her. Both for herself and for her teammates. ToxicTime - Hahah thanks. I'm not the biggest fan of SandyxMike either but I tried to be professional and stick only to canon relationships and crushs. You won't name your reasons? i really appreciate how you made Paulo a Prince. mostly because the Prince class is known as the "Destroyer of _________". And I also like how you made Paulo associated with the Time aspect since Time players are somehow involved in the concept of death. Paulo kinda is the Destroyer of Time if you think about it. All the other characters are greatly designed, good job! I finally found the picture! Anyway, great job. I'm a huge fan of both as well. One day I was reading homestuck, and I saw an add for one of several other web comics in an advertising alliance? or something ... and there was one with cats, and it was called Bittersweet Candy Bowl.